My living room makeover is a slow but steady process. Its a complete overhaul with built-ins being added, a fireplace wall instillation, painting cathedral ceilings, crafting new curtains, reupholstering chairs, and refinishing tables. Between the list of projects and the cost of projects, we are in it for the long haul. 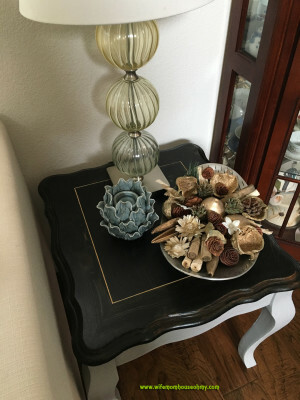 And for this next step in the remodel, I took on two side tables. 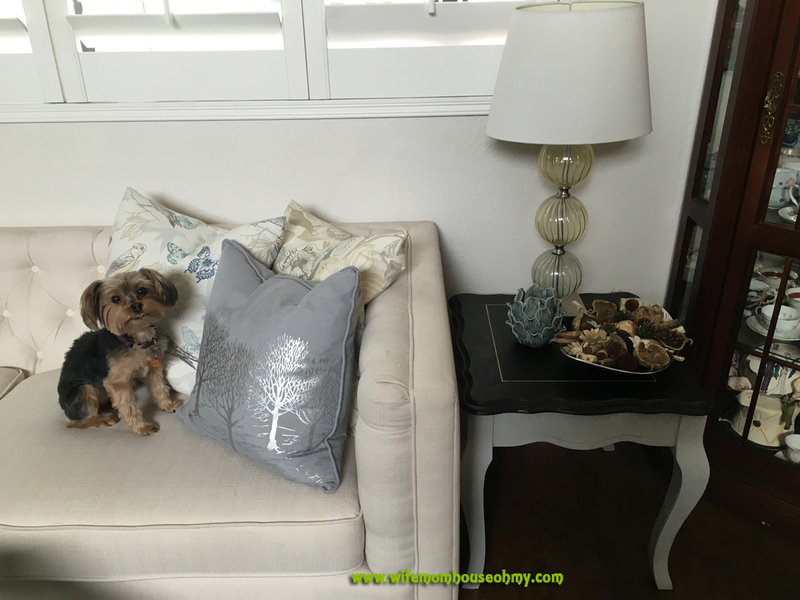 When my husband’s previous marriage ended, he inherited the furniture, which included a coffee table and pair of side tables. I’m a firm believer in the energy things take on and in this case much of the furniture from his previous marriage had a negative energy about it. We decided to donate or sell most of the furniture from his past life mostly because it didn’t fit the vision of the house we were trying to create. And I was grateful to get rid of the negative energy. That said, there were a few pieces that I felt could be totally reconceived to fit our design and in the process shift the energy to a positive feel. Enter the coffee table and side tables. I have plans for the coffee table, just not in our living room. But the side tables would work perfectly in our new living room design. Originally screaming country, they were a red knotty pine with curved lines and design indentations. At first, I was sure I was just gonna have to get rid of them. But the more and more I looked at them, my mind started to envision the lines of the tables in a different palette and remembered how beautiful tables with insets were. 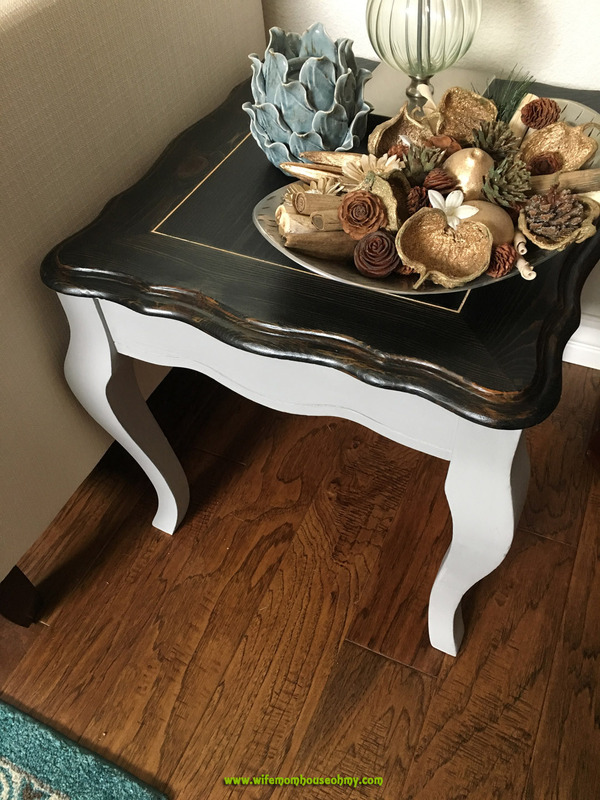 The plan was pretty simple: dark table top, light inset and gray chalk paint bottom. 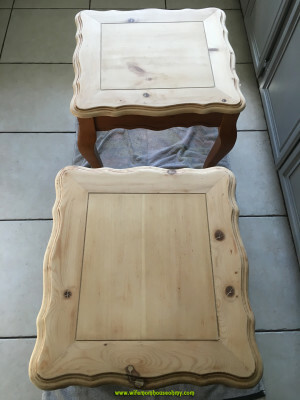 The remodel of these two country side tables started with sanding down the table top using at least 120 grit sandpaper. 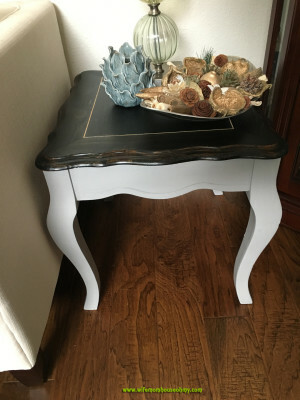 With chalk paint, you do not need to sand so I only had to sand the top. Unfortunately, with staining I had to take it down to bare wood. 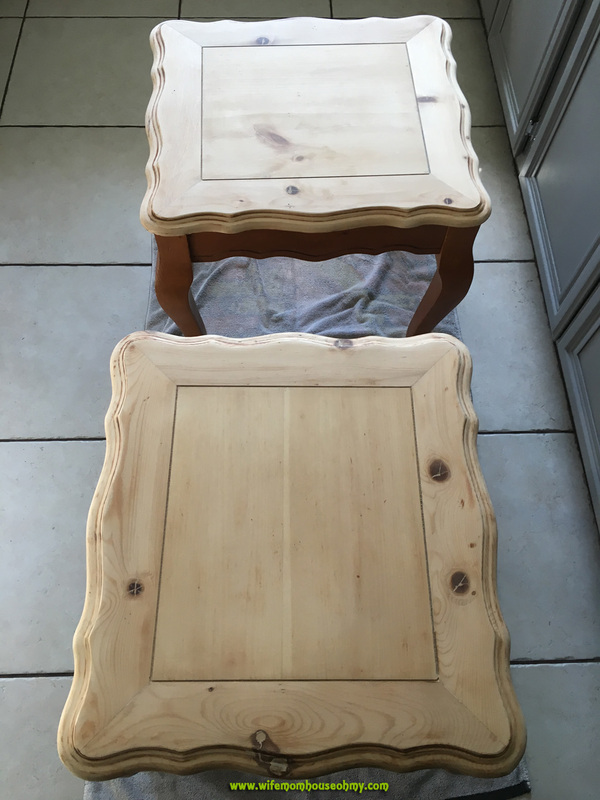 Luckily, unlike my kitchen table, the stain on these two side tables was not too deep. 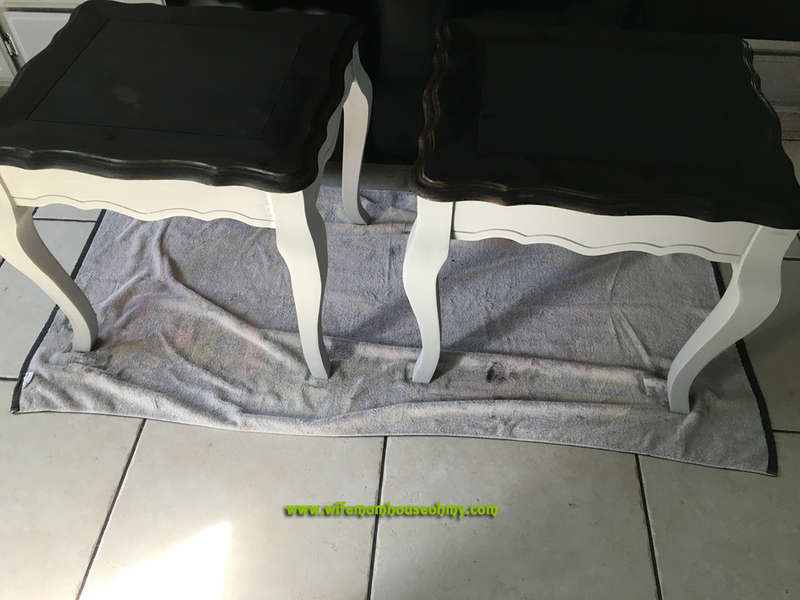 After wiping off all the sanding residue, I used one of the rags and applied the stain to the top of the tables. Just like most stains, I left it on for about 15 minutes and wiped up the residue with one of the rags. Once dry, I repeated the process two more times until I got the color I wanted. I really wanted the dark color and some of the grain showing through but not too much. Next was my favorite paint! 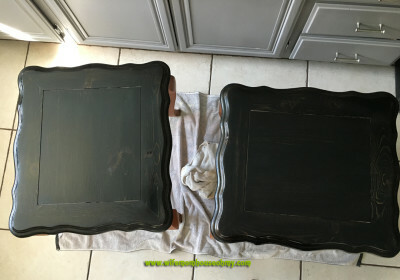 Chalk paint! Using the one of the sponge brushes, I applied three coats of chalk pain, making sure to let each coat dry in between. I love how you can basically paint over anything and get a beautiful finish. Once completely dry, I applied a clear soft wax over the chalk paint areas. The trick is to use the specialty wax brush and really work the wax over the paint. Once completely covered, I took a clean cotton (no loose threads or ‘dust’) rag and buffed the wax to a beautiful matte luster. Adding the inset should have been easy except for the fact that the wood filler was on the dry side. I made it work and the principle is the same but it took me a heck of a lot longer than it needed to. I worked the wood filler into the inset by taking a little bit onto my finger and pressing it into the grove. With a wet rag, I wiped the excess up. Once completely dry, I used the last sponge brush and applied the polyurethane over the top of the table. The most important to remember was to go with the grain. Given the fact that the table has the center and the side bands going in one direction and the top and bottom bands going in the opposite, it took a little finagling. Ultimately, to give it the right amount of protection, I applied three coats. Again, I made sure each coat was dry before applying the next. After a full 24 hours, they were ready for display and use! Oh and I just love them! Negative energy all gone and they feel like a brand new purchase. I so can’t wait to have the entire living room redone. I know they will look a-maz-ing in place. Thanks. Mom’s really are our biggest fan.